I believe all of the cards are black-bordered. (see pics). Picture #1 contains about 35 ultra-pro 9 card sleeves, (there are cards on both sides) none of these trading cards are depicted in picture #2. The Desolation of Smaug. 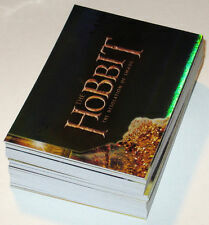 THE HOBBIT FOIL PARALLEL BASE CARD LOT. missing the following cards to complete the set Condition: near mint. Doing that is against U.S. and international laws. (Collector's Update edition) cards in NM/M condition. It is not a complete set. The Scan is of the actual cards that you will receive: it is not a promotional pic! Realms of the Elf-lords. 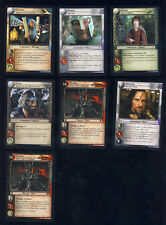 Lord of the Rings TCG 34 cards Decipher. ΝΟ DUPLICATES. A super add to your Lord of the Rings card collection. The following cards are included. All the cards are in great condition and they have never been played. It is not a complete set. The Scan is of the actual cards that you will receive: it is not a promotional pic! Gandalf, Frodo, Gimli and Elendil are all foils. THESE ARE NOT IN ORDER, SO I DON'T KNOW IF A COMPLETE SET CAN BE MADE. THERE WILL BE COMPLETE SETS, PARTIAL SETS, SET BUILDING LOTS, PLAYER LOTS, TEAM LOTS, SINGLES AND MORE. SET BUILDING LOTS MAY OR MAY NOT MAKE COMPLETE SETS. You get 72 cards numbered from 91 thru 162. The cards are in Fine condition, glossy, sharp corners, no creases or bent corners. There is a pic of the front of each card but just a sample of the back. The Desolation of Smaug. THE HOBBIT DWARF Insert Card Lot. Condition: excellent-near mint. Doing that is against U.S. and international laws. 10 Cards Total. Hi all, up for sale is this lot of 6 LOTR Promos, consisting on EOWYN - Lady of Rohan - 0P17. SHELOB - Last Child Of Ungoliant - 0P48. Hi all, up for sale is this lot of 9 LOTR RARE CARDS, consisting on. You get the following cards: 26,51,66,77,78,81,89,100,113,117,118,119,143,153&156. The cards are in Fine condition, glossy, sharp corners, no crease or bent corners except as notes. May have slight wear along edges. Lord of the Rings The Two Towers "Saruman" (Christopher Lee) Autograph Card by Topps 2002 in Near Mint to Mint condition, it was pulled straight from the pack and into a plastic sleeve and Top loader and is from my own collection of Trading Cards which I have accumulated since 1999. Thanks for looking. I would appreciate immediate payment on any purchase you make as non-payment items will automatically be referred back to eBay after 4 days. Thank you. 1 of the cards is signed by Sean Bean as Boromir. This is the original ring binder which contains 3 plastic sheet with 21 cards in total. There maybe a bit of light reflection on the photos when I took them but the marks are not on the cards. Folgende Karten sind dabei: 0: Dwarven Axe, Gondor‘s Vengeance, Under The Watching Eye 1: Elven Bow, Dwarf Guard, Pippin, Merry, Eregion‘s Trails, Orc Scimitar (2x) 2: Uruk Messenger (2x) 3: Uruk Bloodlust 4: Uruk Brood, Saruman 5: The Bridge of Khazad-Dûm 12: The Balrog (2x) Nichtraucherhaushalt ohne Haustiere. Bitte beachten Sie meine anderen Aktionen. Verkaufe noch weitere Sammelkarten! These are excellent cards as each one has a short paragraph of information on it. 2, 4, 7, 8, 11, 15, 30, 33, 34, 35. You will receive cards numbered. The stunning FOTR Prismatic cards (QTY x 10) which have beautiful reflective colours. (see photos). Perfect for the ultimate LOTR collector ! Just think, this actual LOTR binder has been in the hands of Gollum himself ! La Désolation de Smaug. Film The Desolation of Smaug. Le Hobbit DWARF Insert Lot Lot. J'embarque dans le monde entier. à partir de. Near Mint - A card which appears almost perfect upon close inspection. The stunning FOTR Prismatic cards (QTY x 10) which have beautiful reflective colours. (see photos). 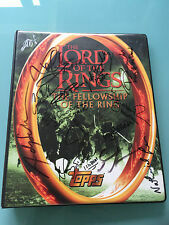 Just think, this actual LOTR binder has been in the hands of Gollum himself ! (This is the Ultra - rare UK binder !). La Désolation de Smaug. Film The Desolation of Smaug. Le Hobbit J'embarque dans le monde entier. à partir de. Rare! 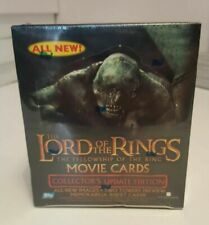 LOTR Fellowship of the Ring Update Edition Trading Cards Sealed Box of 36 booster packs. Each pack contains 7 Trading cards. Randomly inserted Autograph Cards, chase cards and more! Box is very good condition and factory sealed. Please see our other listings for more Trading Cards, Toys, Games and Collectibles. 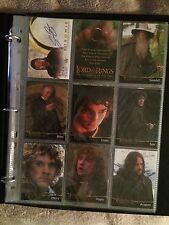 Topps 'The Lord Of The Rings' The Fellowship Of The Ring Card Album Inc 90 Cards. Condition is Used. Dispatched with Royal Mail 1st Class. 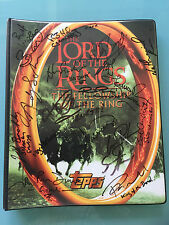 Just think, this actual LOTR binder has been in the hands of Gollum himself ! The binder itself has been signed by 7 of the original actors from the Oscar winning Trilogy ! This binder has been kept out of light, and not displayed. The reverse of the cards should make up a map of Middle Earth but this is not the complete set as there were a total of 32 cards to the set. All are in perfect mint condition. Promotional flyers given out by Showcase Cinemas. (Eingeräumt). Alle Karten sind unbespielt und im Neuwertigen Zustand sie wurde sauber und trocken und dunkel gelagert. Just think, this actual LOTR binder has been in the hands of Gollum himself ! Bob Anderson - Swordmaster on the LOTR Trilogy - Also British Olympic fencer (deceased). - Two Towers collectors card set 1-162.